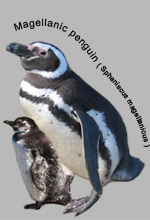 - The scientific name "Sphenisciformes" (Order including all living and extinct penguins) derives from those penguins, first described in literature, namely the African penguin (Spheniscus demersus), the South American magellanic penguin (Spheniscus magellanicus) and the Humboldt penguins (Spheniscus humboldtii). In the opinion of zoologists, these are the typical representative of penguins. 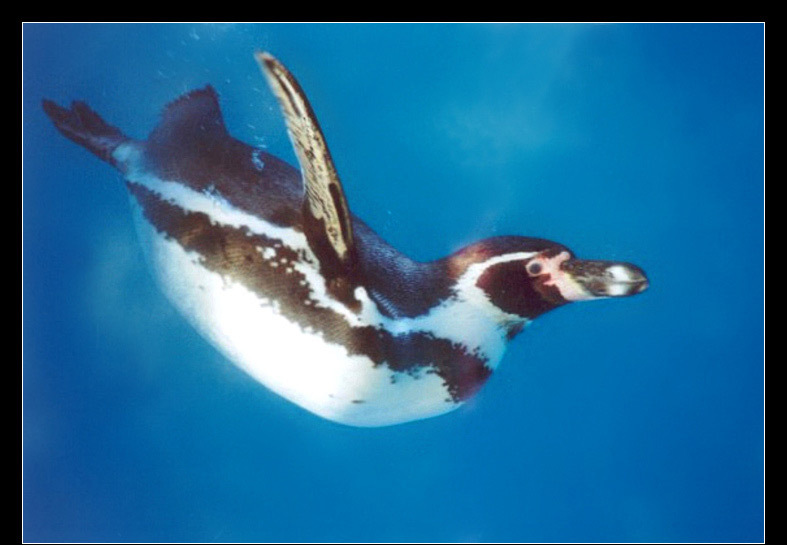 - The word "Spheniscus" comes from Greek, meaning "wedge shaped", referring to the form of wings and body of penguins. They all are called once jackass penguins, while their noise sounds like a jackass. - All Spheniscus penguins have a broad black band that runs in an inverted horseshoe shape around their fronts and a pattern of black spots on their chest. This pattern is unique and different for each bird, similar to our fingerprints. Their feet are not pink or orange, like with the Pygoscelis and Eudyptes species, or black, like with the Aptenodytes, but a mix up of both black and pink. - They are hole breeders, which is logical, as they live up northern and need protection against the sun. The bare skin pink area around their bill too is used to lose warmth. When it is still too warm, they pant like a dog. Their body has a less dense plumage and a thinner fatty layer, all for the purpose of thermal insulation. Characteristic for the fact of being hole breeders is the way they walk: face down and their flippers forward. (similar to the little penguin, which is a hole breeder too). - They dig out their hole (burrow) with bill and feet. First the bird snaps with its bill at the clods of earth and throws it behind him. Then he sweeps the loose earth further away with his feet and goes on digging with its bill. Soon he has a hole, which eventually can become 2 metres long and 1 metre deep, with a breeding room at the end. 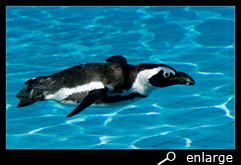 - They all belong to the warm sea penguins, meaning they live in moderate or tropical oceans. African penguins have a broad black band over their chest, which runs like an inverse horseshoe over their front. Their chest is covered with a pattern of black spots, unique for every bird. 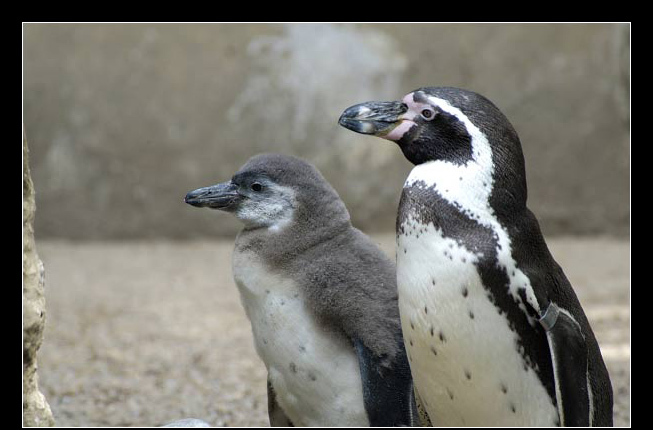 They look like Humboldt penguins, but humboldts are slightly heavier, have longer flippers and a smaller white band on their head. (see also characteristics-differences). Their tail is short. They have a broad white band over their head and a naked pink area above their bill and eyes, along which they can cool off. Their feet are pink and black. 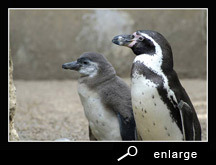 African penguins measure around 65 cm. Their weight varies during the year from 2,5 till 4 kg. Only recently the name African penguin is generally accepted. The older names like blackfooted or cape penguins are not recommendable: African penguins don't have completely black feet, and they are not only found around the Cape. 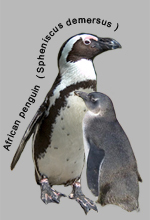 Linnaeus mentioned in 1758 two species in his Systema Naturae: the African penguin (called 'Diomedea demersa') and the rockhopper (called by him 'Eudyptes crestatus'). The species name demersus is Latin and means "under water". They breed on the coast of South Africa, Namibia and the neighbouring islands. They remain the whole year on their breeding ground. Especially threatened by oil spills. The total breeding population is estimated at 58 600 pairs. 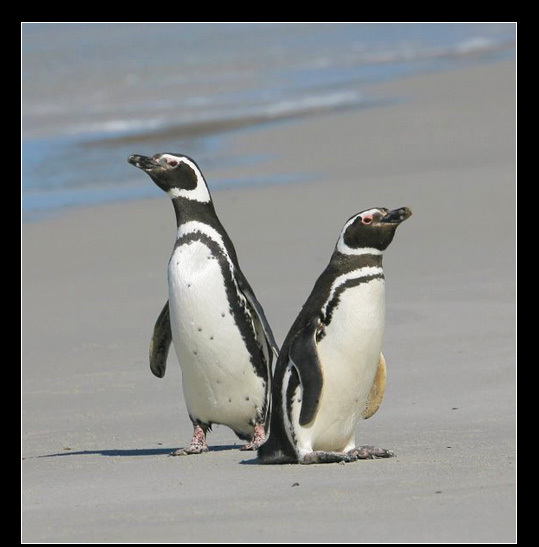 African penguins are sedentary birds and remain all the year round near their breeding place. Nests are digged in sand, between grass and bushes or unter rocks, protected against the sun and close to the water. They used to nest in guano (excrements of older generations), but while people cut down several layers, there is little left over for them to dig in. 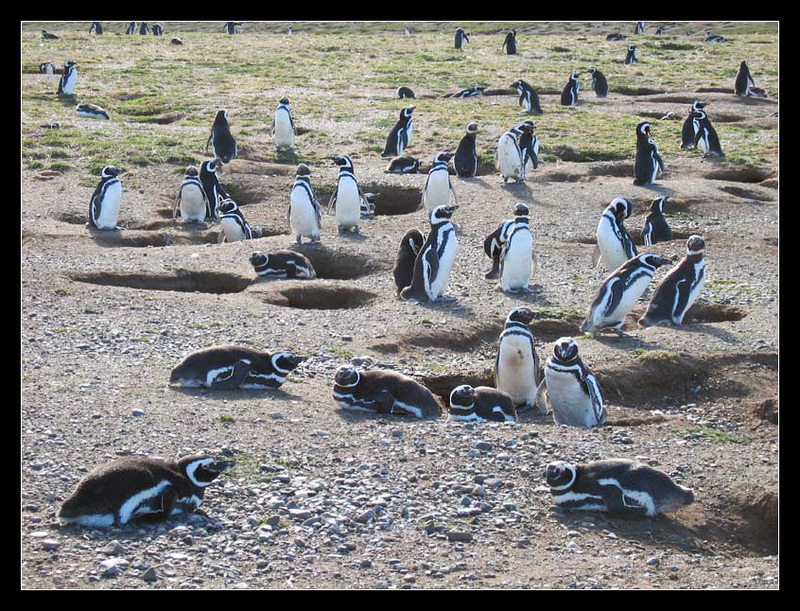 Nowadays african penguins have to dig in sand (collapse risk) or breed in the open air, with risk for overheating and dehydration. And because people too prefer sun-drenched beaches and coves, the penguins often have to flee to more remote, unsuitable places. Still, since 1983 there is one colony at Simonstown (Cape Town) lying in the middle of civilization, being a popular tourist attraction and in the meanwhile declared as a nature reserve. 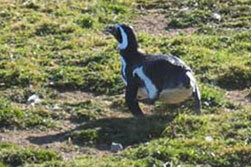 While african penguins all the year round remain in their breeding ground, they also can breed all the year round. 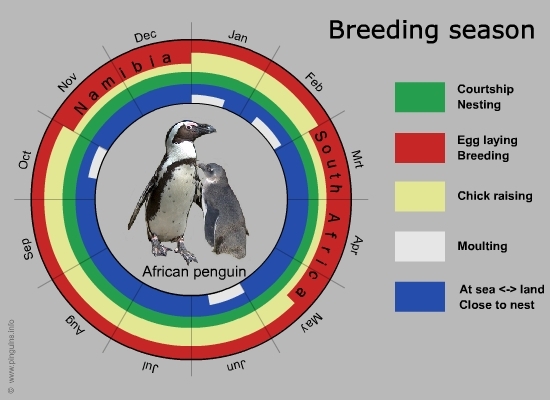 There are two peaks of breeding, depending on the place: in South Africa most of the egss are laid in March-April, while on the west coast in Namibia it is November-December. In good years 2 eggs are laid and will hatch too. Incubation time lasts 38 till 41 days, with alternating shifts of 1-3 days by both parents. The chicks are guarded and fed by both parents alternately during 40 days. After 70 till 100 days they moult to their juvenile plumage and fledge. They mainly eat fish, sometimes complemented with some crusteceans. They fish close to the water surface. While anchovis and sardines also are commercially fished, they sometimes have to forage further away, with a risk for their survival. 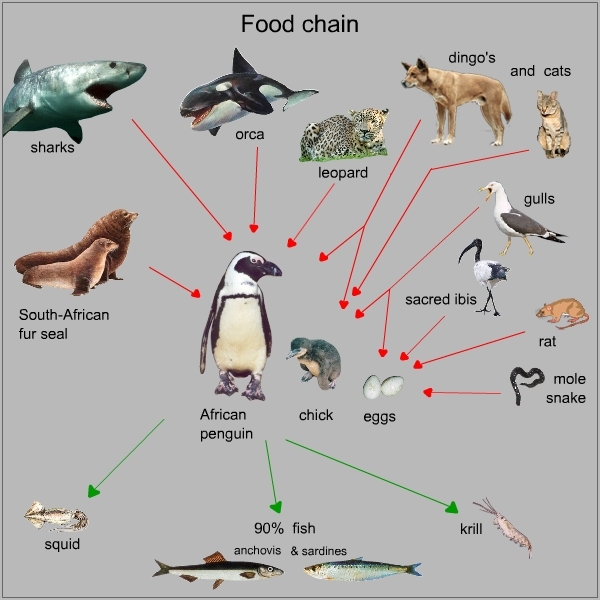 While African penguins, besides on Robben, Dassen and nearby islands, also breed on the mainland, a lot of predators can be dangerous. Wild roaming dogs and cats kill adult birds, and even a leopard has been observed doing this. The chicks are robbed by gulls and by the same cats and dogs too. The eggs are threatened by ibisses, rats and snakes. In the water, especially sharks and fur seals will chase on them, and even an orca will take an adult bird. 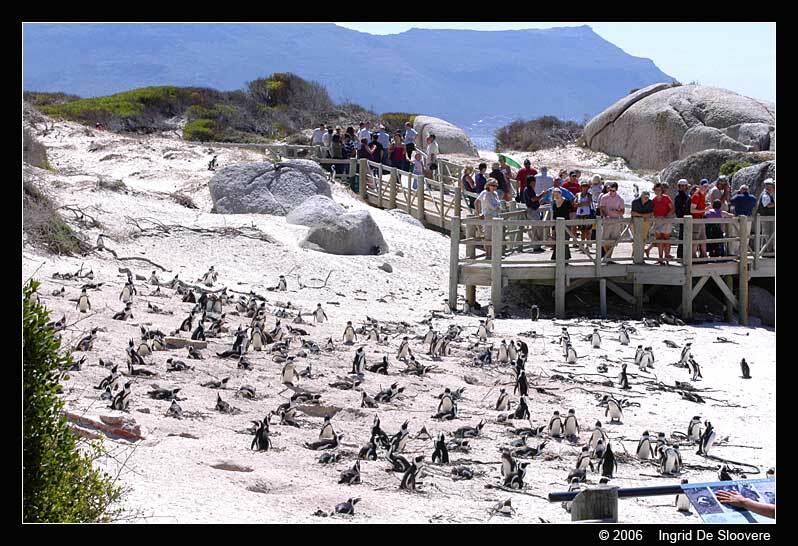 And if you count the influence of people in, it is a wonder there are still african penguins surviving. In earlier years, eggs are robbed and eaten by thousands (enemies), declining the population number rapidly. 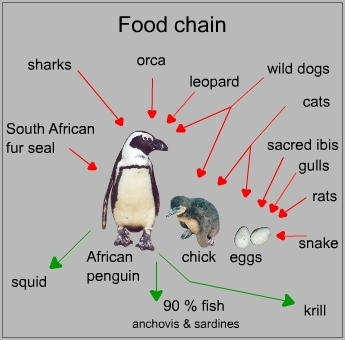 Overfishing of anchovis, pilchards and other fish force the penguins to forage further away, making that the chicks have to wait longer for their food, with all its consequences. Even traffic on the mainland is a threat. And everybody remembers the largest rescue for birds ever made. When in June 2000, the Treasure sank before the coast of Cape Town, a quarter of the whole african penguin population suffered of it. And this wasn't the first and unfortenately will not be the last oilspill, with a disastrous influence on sea birds. Especially the sea routes around the capes of Africa and South America are very busy for oil tankers. Humboldt penguins have a broad black band over their chest, which runs like an inverse horseshoe over their front. Their chest is covered with a pattern of black spots, unique for every bird. They look similar to african penguins, regarding the black band. 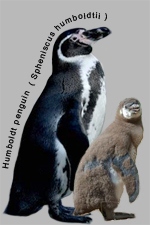 The main differences: humboldts are slightly heavier, have longer flippers and a smaller white band on their head. (see also characteristics-differences). 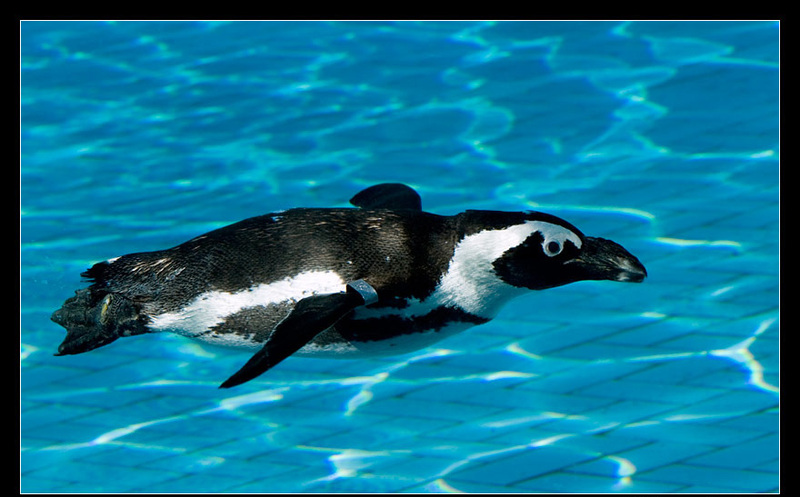 The naked (bare skin) area is situated under their bill, and at the african penguin it is above the bill. The juvenile humboldt penguins are less black, and they don't have their typical black band and spots. Humboldt penguins are about 60 cm tall. Their weight varies during the year between 3 till 5 kg. 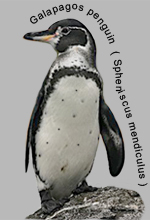 Meyen gave the humboldt penguin its name in 1834. The Humboldt penguin is named after the German nature scientist Alexander von Humboldt, who visited South America in 1799. Sometimes humboldt penguins are called peruvian penguins, which is deprecated, while they live in Chili too. 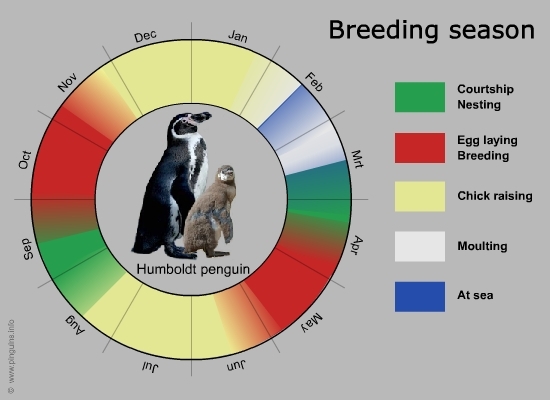 Humboldt penguins breed on the west coast of South America (Peru and Chili) and on the islands close to the coast in the north almost up to the equator. They take advance of the cold Humboldt current. They stay all the year round close to their nesting ground (sedentary birds). The total breeding population is estimated at less than 10 thousand pairs. They nest in burrows, which they dig out in the sand or "Guano", the latter being stolen by people. They seek for protection against the sun under rocks and/or bushes, in groups of ten till hundreds of pairs. Often they share their colony with humboldt cormorants or peruvian pelicans. They can breed all the year round, but success is influenced by the temperature of water and the phenomenon El Niño. There are two peaks, when most of the eggs are laid: half April-May and mid September-October. In good years both chicks are raised. Chciks will fledge after 10 till 12 weeks. When all circumstances (weather, food, temperature) are good, they even can breed twice a year, but it is rather seldom. When the first breeding attempt fails, they will try to lay a second clutch and raise chicks in the same year. The moulting period for adult birds takes place in February-March, amd the male of the pair will moult before the female, with a difference of 10 days. The juveniles and non-breeding pairs will moult earlier too. 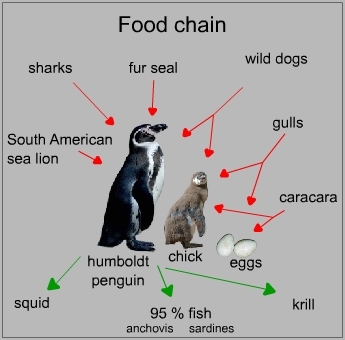 Humboldt penguins mainly eat small fish like anchovis and sardines. They hunt in groups and close to the water surface (till 30 m). The chicks and eggs are prey to wild dogs, foxes and gulls. The caracara too can be dangerous for eggs, especially when humboldt penguins breed in the open. In the water, adult birds are killed by sea lions, fur seals and sharks. But that is just a natural selection. In contrast is the disastrous influence of people on the survival of humboldt penguins, which became very shy. By cutting down massive layers of guano (especially in the 19th century), their existence is threatened, while loosing their nests in this guano. 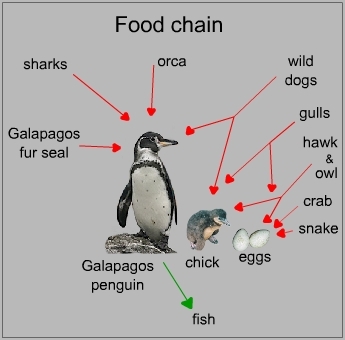 Overfishing of anchovis, sardines and other fish force the penguins to forage further away, making that the chicks have to wait longer for their food, with all its consequences. Magellanic penguins have a broad black band under their chin and a second one, which runs like an inverse horseshoe over their front. Their chest is covered with a pattern of black spots, unique for every bird. 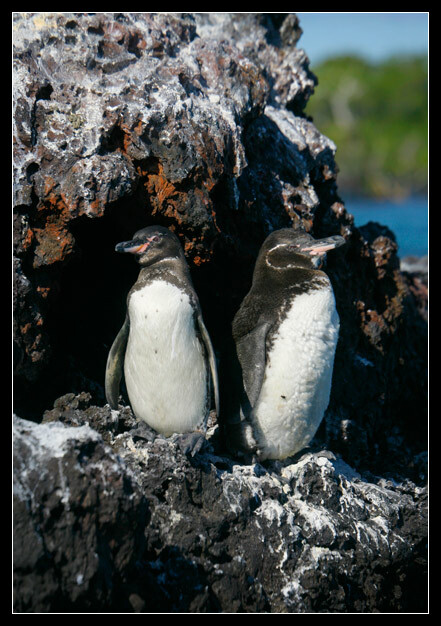 They look similar to galapagos penguins, but there are some differences : magellanic penguins are larger and heavier than galapagos penguins, and the white band over the cheeks is much smaller (fainter) on the galapagos penguins. The naked, bare skin area is situated above the bill and eye, in contrast to galapagos where it is under the bill. 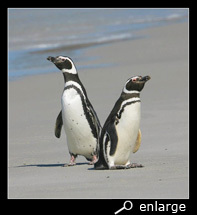 They look, qua size and head, similar like african penguins, but are a bit more heavy and stocky. Furthermore magellanic penguins have a second black band over the throat. On the Falklands, they sometimes share their beach with gentoo penguins, and then you can notice a difference in pose. Magellanic penguins stand much more face down with their flippers forward (typical for hole breeders) than the upright pose of gentoo penguins. Magellanic penguins can be observed running on feet and flippers, while gentoo penguins walk upright.. They are about 65 cm tall. Their weight varies during the year between 4 till 7 kg. Ferdinand Magellan gave his name to the magellannic penguin, when, in 1519, he sailed around the world as the first European (and most likely as the first human). The Italian Antonio Pigafetta, who accompanied Magellan on his trip and wrote down their adventures, was the first person who described this penguin species in December 1519. They considered them as non flying geese and an easy to catch supplement on their menu. 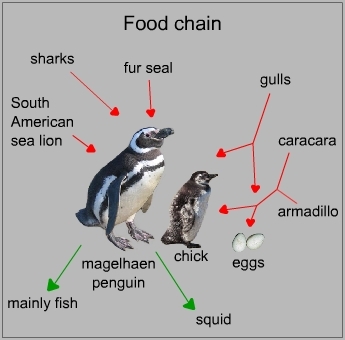 The magellanic penguin sometimes is named jackass penguin (mainly on the Falklands), which can cause confusion, while in English the african penguin is also called like that, and in Dutch the "ezelspinguïn" literally translated means the English gentoo penguin. Magellanic penguin: firstly named by Sonnerat in 1776, later on by Forster in 1781 who called them Aptenodytes magellanicus. Magellanic penguins breed on eastern and southern coasts of South America (Chili and Argentina), on offshore islands and on the Falklands. 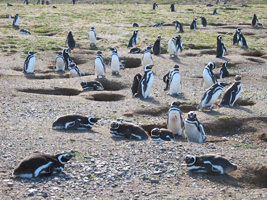 The largest colonies are located in Punta Tombo (Argentina) and on the Falklands. The total breeding population is estimated at 1,3 million pairs. They breed mostly under bushes or in burrows, making use of the available vegetation. While they can hide their nest so good, you can stand in the middle of a colony without noticing. The colonies are abandoned between May and August, and the penguins at sea. Magellanic penguins migrate (migratory birds) during winter to the north up to Brazil and Peru. In September they come back to breed. Two eggs are laid in October and, in good years, both chicks will be raised succesfully. Incubation time lasts 39 till 42 days and is equally shared by both parents in long, alternating shifts of 10 till 15 days. After hatching, the chicks are alternately guarded by one parent and fed every 2-3 days by the other one, for about 29 days. Afterwards the chicks are left alone, while both parents go foraging and feed them. Chciks moult to their juvenile plumage and fledge in February at the age of around 60 à 70 days (10-12 weeks). 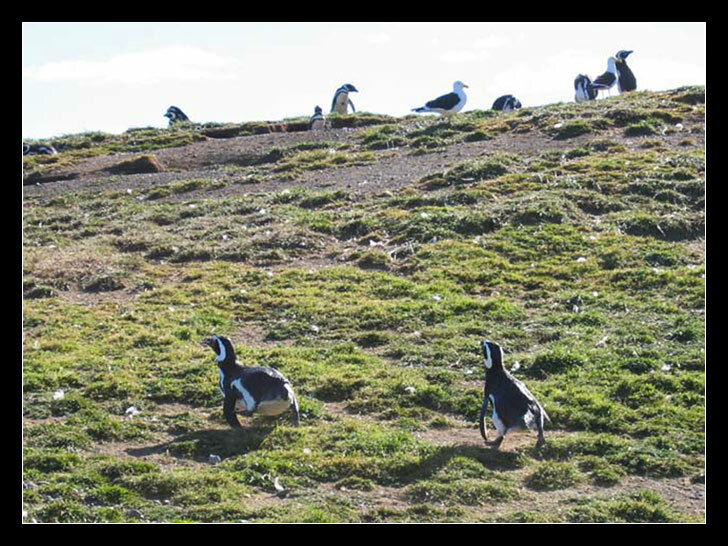 Afterwards the adult penguins too moult in March and leave for sea, till they come back in September for a new breeding season. They are faithful to their nest and return every year to the same place, so partners will find each other again. 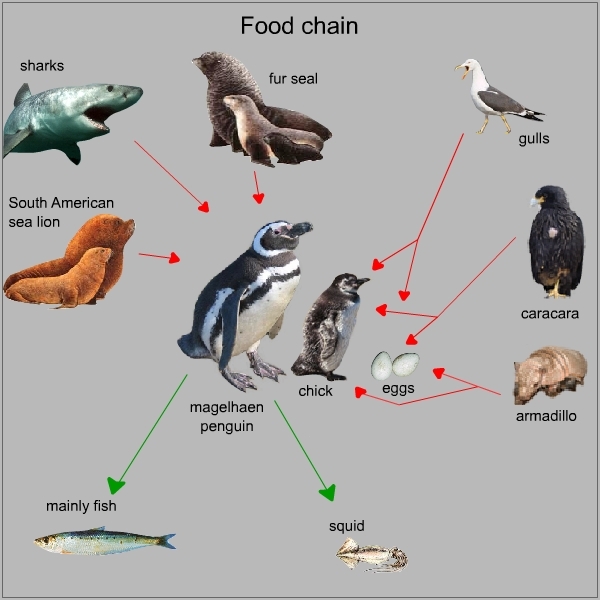 Magellanic penguins eat a mixture of squid and small fish. Although they can dive to a depth of 90 metre, they forage most of the time at a depth around 30 metre under the water surface. Although sea lions don't eat magellanic penguins, they use to chase them and play with them, so birds get injured and even die. Especially giant petrels and skuas take advantage of this behaviour. 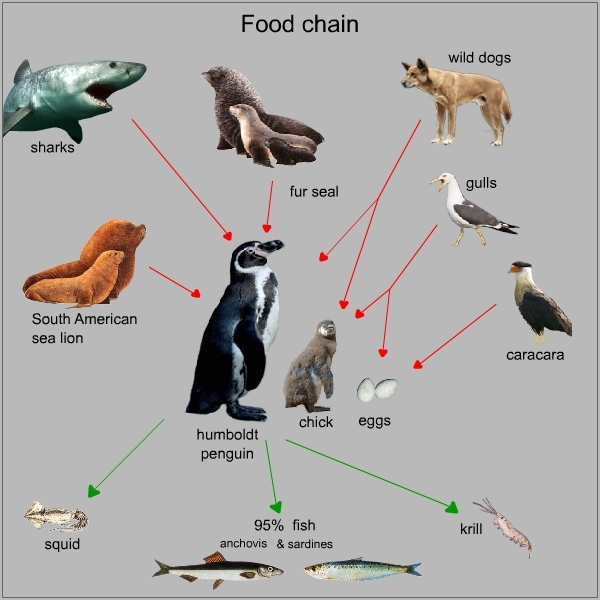 Sharks and fur seals too are predators on magellanic penguins in the water. Eggs and chicks are robbed by gulls and caracaras geroofd and even an armadillo dares to steal eggs. When nests are protected by high tussocks, eggs and chicks are more safe to threats from above. Galápagos penguins have a small white band that runs from above the eye and gets broader under the chin. Their face is almost complete black, and a vague black band runs over the throat and a second black band runs like an inverse horseshoe over their front. Their chest is covered with a pattern of black spots, unique for every bird. 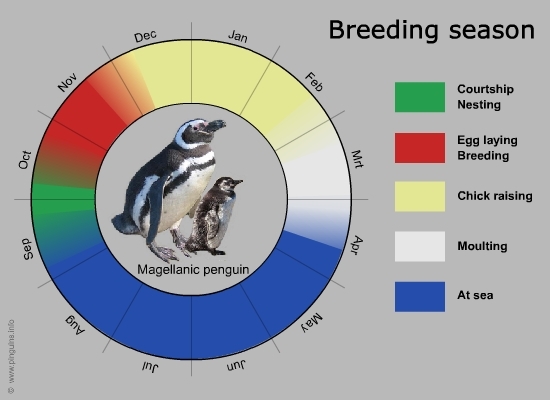 Although the bands look a lot like those on the magellanic penguin, there are some significant differences. Magellanic penguins are taller and the black band in front of their throat is much more distinct than on Galápagos penguins. 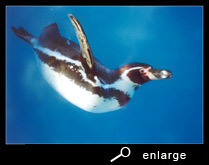 The naked, bare skin area is situated under the bill (similar to humboldt penguins). Galápagos penguins live practically on the equator, but under the influence of the Humboldt current the water is cool (15°C), so those birds can find the necessary chilling off. At daytime you will seldom see them on land. Galápagos penguins are 40 à 45 cm tall. Their weight varies during the year between 1,6 till 2,5 kg. 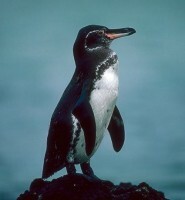 The Galápagos penguin is first mentioned by Sundevall in 1871. The species name "mendiculus" means "little beggar" and probably refers to their insecure way of running and their length. Galápagos penguins breed on the Galápagos islands (Fernandina and Isabela) on and directly south of the equator! The total breeding population is estimated at less than 800 pairs. While the species needs urgent protection, the precise locations of their nesting ground are kept a secret. 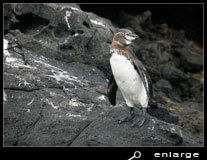 Galápagos penguins breed in burrows in the sand or in caves between the rocks (old lava). They too, like humboldt penguins, are very shy and on land they are more nocturnal. At daytime they hide or are swimming at sea. 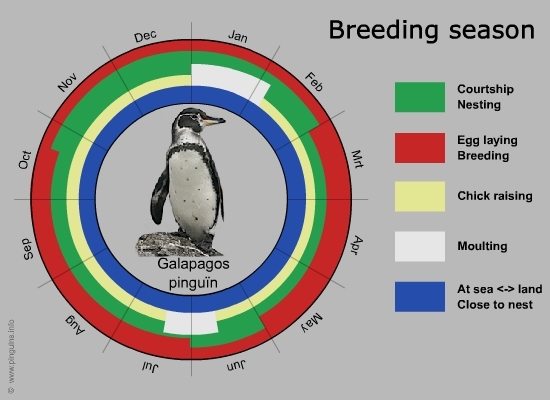 While the land temperature is constant (equator) on the islands, they can breed and raise chicks all year (sedentary). Their breeding success depends of the temperature of the water and the current that influences this temperature. Especially the phenomenon El Niño has a large impact on the breeding success. When the water is chilly (< 22°C), and as result food is plenty they will raise chicks successfully. They lay two eggs, but often only one chick survives. Incubation time of 38 till 40 days , is equally shared by both parents. Chicks hatch and are guarded and fed alternately shared by both parents for around 30 days. Afterwards the chick is left alone and both parents go foraging, to satisfy the appetit of the growing chick. At the age of 60 till 65 days, chicks moult to their juvenile feathers and fledge. 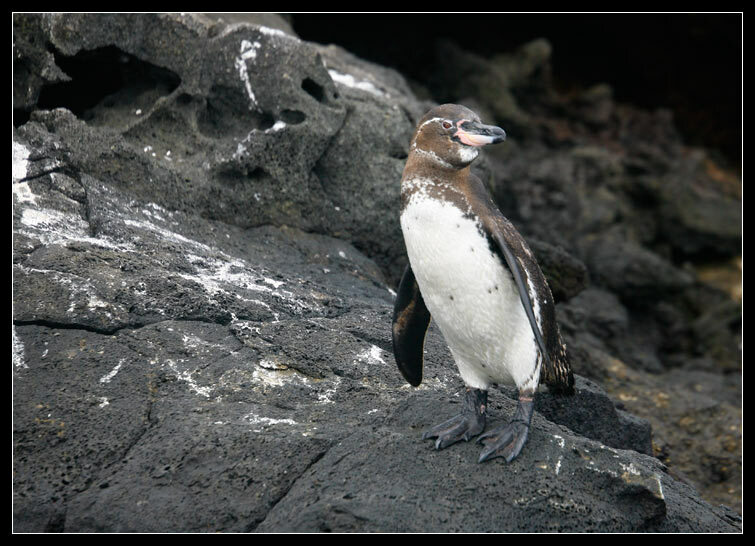 In contrast to other penguin species, adult galápagos penguins will moult before or during breeding, and not afterwards. Moulting lasts around 10 to 15 days and happens twice a year, just like breeding itself. 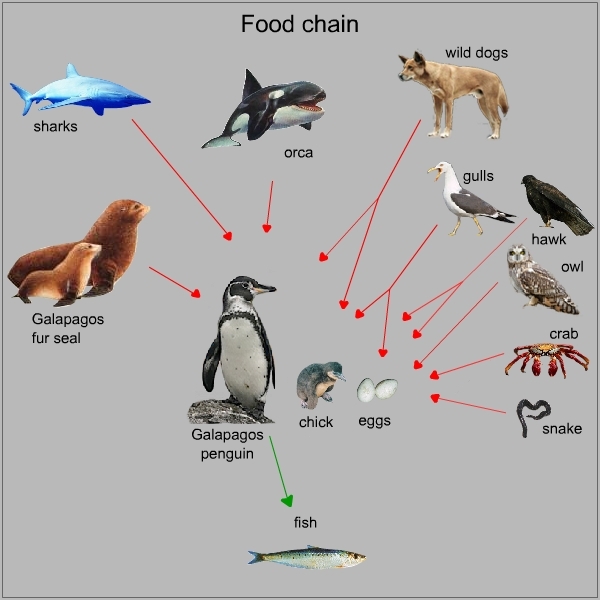 Galápagos penguins probably eat mainly fish, like pilchards and anchovis, but more research is needed. They hunt in groups on schools of fish, staying under water for short moments. The Galápagos islands have a rich fauna and penguins here have many enemies. Crabs and snakes steal eggs and sometimes chicks too; hawks, gulls and owls steal eggs and chicks. Wild dogs and cats will kill chicks and even adult birds. In the water swim sharks, orcas, sea lions and fur seals and they all take penguins.